From the collapse of housing prices to the thousand-point drops in the stock market, the past five years have been full of economic crises. These changes not only affect the overall market--they can also drastically influence your personal finances and day-to-day life. In this easy-to-understand guide, Peter Sander explains how the financial system works, as well as the most important concepts, terms, and programs in economics. Using simple language, he details how the evolving climate will affect world economies--and what kind of shifts you are going to see in your finances as a result. 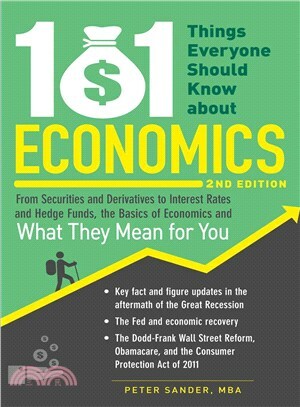 An essential guide, 101 Things Everyone Should Know about Economics, 2nd Edition helps you fully understand today's economy and shows you how to secure your financial future even as the market changes. Peter Sander is an author, researcher, and consultant in the fields of personal finance, business, and location reference. He has written thirty-nine books, including All About Low Volatility Investing; Value Investing for Dummies; The 100 Best Exchange-Traded Funds You Can Buy, 2012; The 25 Habits of Highly Successful Investors; and Cities Ranked & Rated. He has an MBA from Indiana University and has completed Certified Financial Planner (CFP) education and examination requirements.